Biography of French Symbolist Painter. An early exponent of Symbolism, and an influential figure in French painting of the 19th century, the artist Gustave Moreau was known for his visionary style of mythological painting and imaginative history painting. More than any other artist, he had a natural flair for introducing "magic" into painting, and for incorporating the incomprehensible and unconscious into his compositions. This made him one of the leading Symbolist artists, but it also makes him an important source for 20th century Surrealism. A natural embellisher, who thrived on textural effects, Moreau painted with thick impasto, creating a luxurious, encrusted finish. At first he was influenced by Romanticism, and by Romantic artists like Theodore Chasseriau (181956) and Eugene Delacroix (1798-1863); also by Italian paintings from Byzantine to Renaissance times, and by the great Dutch Realist Rembrandt (1606-69). His works are marked by mystical imagery - Salome and Orpheus were favourite themes. Highly prolific during his lifetime he created over 8,000 paintings, drawings and watercolours - the latter being mainly abstract studies, which may have influenced the Abstract Expressionism movement, as well as European painting movements like Art Informal and Tachisme. Towards the end of his life Moreau became a popular teacher at the Ecole des Beaux-Arts: his students included the Fauvist Henri Matisse (1869-1954) and the Expressionist Georges Rouault (1871-1958). One of Moreau's most famous paintings is his watercolour The Apparition (1876, Louvre). Moreau was born in Paris in 1826, his father, an architect with a talent for drawing, encouraged his son's interest in art. At the age of 20, Moreau entered the Ecole des Beaux-Arts, studying under Francois-Edouard Picot (17861868). Picot was a highly talented painter of mythological, religious and historical subjects who himself had studied under the great neoclassicist Jacques-Louis David (17481825). Moreau admired Delacroix (17981863) and also fell under the influence of Theodore Chasseriau, who would be an important influence for the next decade on both his subject matter and style. Moreau's first oil painting was a Pieta, now located in the Cathedral of Angouleme. In 1853 he exhibited for the first time at the Salon and the Paris Great Exhibition. In 1856 Moreau travelled to Italy to study the great Masters of the quattrocento, as well as Byzantine mosaic art. On his return to Paris, he exhibited at the 1864 Salon in Paris, with his painting Oedipus and the Sphinx (1864, Metropolitan Museum of Art, New York). Painted in a Classical style and finished according to the canons of academic art, the painting displays an awareness of the 1808 version painted by J.A.D.Ingres, which he had already sketched in the Louvre. It also has overtures of early Renaissance painter Andrea Mantegna (1431-1506). In any event, it turned Moreau - up until then virtually unknown as an artist, despite being 38 years old - into an overnight success. He followed it up the following year with Jason (1865, Louvre) and in 1866 with Orpheus (1866, Louvre), which was purchased by the State. Moreau's choice of a mythological subject in his Oedipus, and the deliberate way in which he sought an archaic style of painting, differentiated him from the Realists and Naturalists who were popular in the 1860s. Although a contemporary of the Impressionists, and of Edouard Manet (18321883), Moreau's brushstroke bore no comparison. His work was not rooted in modern art and contemporary society, but in a classical, mythical world. The writer Emile Zola dismissed Moreau's paintings as 'a mere reaction against the modern world,' specifying the ideological issues at stake when he added 'the danger to science is slight'. Moreau used a marked impasto, creating a richness and a luxury which he insisted was necessary to art. Within five years of his first successful showing at the Salon, Moreau stopped exhibiting his works, and refused to allow them to be reproduced. Instead he retreated to his house and studio at Rue de La Rochefoucauld, Paris. This house is now a National Museum, and displays the majority of his works - over 850 paintings, 5,000 drawings and 350 watercolours. Moreau's watercolour The Apparition (1876, Louvre), is one of his best known works. It features Salome who, according to the Gospels, bewitched Herod with her dancing: as a reward she was given the head of John the Baptist. Salome was a reoccurring theme in Moreau's paintings, due - according to critics - to his consumption of opium and its accompanying hallucinations. However, he was in good company, Caravaggio painted his Salome with the Head of John the Baptist in 1607 (National Gallery, London) and before that again, Botticelli painted Salome with the Head of St John the Baptist in 1488 (Uffizi, Florence). In Moreau's watercolour, he creates an Oriental feeling with the complex use of highlighting, incisions and grattage. It is often believed that Oscar Wilde's play Salome (1893) was inspired by Moreau's works, although there is no evidence of the two ever having met. The publicity etchings for Wilde's play were created by Aubrey Beardsley (18721898) in an Art Nouveau manner, to which Wilde objected, saying: "My Herod is like the Herod of Gustave Moreau, wrapped in his jewels and his sorrows. My Salome is a mystic, the sister of Salammbo, a Saint Therese who worships the moon." In 1884, Wilde travelled to Paris and viewed Moreau's Apparition at the Louvre, which had been displayed at the Paris Salon of 1876, drawing large crowds. Moreau set in train Symbolist ideas and an artistic craze for the femme fatale notion of Salome, which Wilde later put into words for his play. Moreau returned to the subject many times, creating 19 paintings, 6 watercolours and more than 150 drawings. Other artists who depicted the theme include Leonardo da Vinci (14521519), Peter Paul Rubens (15771640), Albrecht Durer (14711528), Domenico Ghirlandaio (144994) and Theodoor van Thulden (160669). However, Oscar Wilde stated that only Moreau satisfied him. Although Impressionism was the new avant-garde movement of the 1880s, it was Moreau's paintings, with their emotive, supernatural content that most excited the newly emerging Symbolist movement. This school was a continuation of sorts of Romanticism, and included artists such as John Henry Fuseli (1776-1837), Caspar David Friedrich (1774-1840) and Fernand Khnopff (1858-1921), as well as Gustav Klimt (1862-1918), Odilon Redon (1840-1916), Edvard Munch (1863-1944), Ferdinand Hodler (1853-1918) and the muralist Puvis de Chavannes (1824-98). The Symbolists used mythology and dream imagery to convey their message. The symbols they used in their paintings were not mainstream iconography, but often personal, ambiguous and private. The style had a significant influence on Les Nabis and on Art Nouveau. Despite the undercurrent of mysticism and supernaturalism in his paintings, many critics do not give Moreau sufficient recognition as an inspiration for surrealist artists, despite the fact that Andre Breton (18961966) - the founder and "High Priest" of Surrealism - used to visit the Gustave Moreau Museum in Paris, at every opportunity. In 1891 Moreau took a teaching role at the Ecole des Beaux-Arts. His influence on younger painters extended to many art movements and included Matisse, Henri Manguin (1874-1949), Albert Marquet (1875-1947) and Georges Rouault. Rouault, his favourite student, became the Keeper of the Moreau Museum in Paris. Moreau died in Paris in 1898 and is buried at Montmartre cemetery. 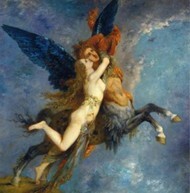 Paintings by Gustave Moreau can be found in some of the world's best art museums, including the Louvre in Paris.